Fiona & Jimmy – There is something undeniable about Fiona Gallagher & Jimmy Lishman.Everything about their lives screams that they should not be together and yet, they are perfect for each other. Jimmy provides Fiona with just the right amount of excitement that she needs to keep her Gallagher blood entertained. While Fiona provides Jimmy with a healthy dose of realism so that he doesn’t get lost in an ocean of selfishness. Lip & Mandy – Lip was Mandy’s light at the end of the tunnel and Mandy was just the person Lip needed at a time when he was seriously in danger of throwing his future away. The love they shared was young and perhaps, even a little niave at times, but it was real. They may not be together now, but that doesn’t mean there’s no hope for them to come together in the future. Ian & Mickey – Very rarely do you meet that one person who gets you on all levels. That one person who knows you better than you know yourself. It is even rarer to meet that person when you are teenager, but Ian & Mickey are the exception to almost every rule love and friendship has spent years cultivating. Because they are the exception “normal” relationship rules do not apply to them, so don’t even try. Kevin & Veronica – Every show has that anchor couple. The couple in which all other couples are measured. 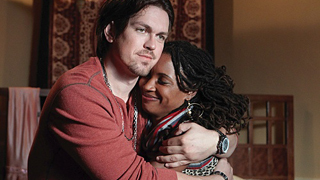 On Shameless that couple is Kevin & Veronica. They are the heart and soul of the show. When they feel joy, we feel joy. When they are in pain, we are in pain. Other couples may come and go and we may mourn their loss, but if we were to ever lose Kevin & Veronica, the devastation would be immeasurable. Carl & Bonnie – You never forget your first love. It colors every other love affair that comes after. Although their love affair was short and filled with armed robbery and petty crime, they were each able to show the other what real love is and that is a lesson they will remember forever.